From any other country, please email to either UK or USA addresses. 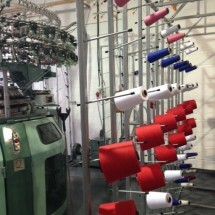 DISCOVERY KNITTING AT OUR MILL IN GREAT BRITAIN. ALL ARE FIRST QUALITY, REPEATABLE FABRICS. ~ Generally Start at 4 Rolls / Per Fabric / Per Colour. ~ We Do Custom Colour Dyeing. ~ These minimums do not apply to all fabrics. Each website product listing shows approximate metres & yards / per 1 roll of fabric. Manufacturing, Shipping & Billing are in meters. Production Packing Lists ~ also list equivalent Yards – Per Roll. ~ Dollars per Meter ~ with reference (only) / equivalent Dollars per Yard. ~ Weights are in GSM on all paperwork. ~ Freight is not included in quotes. Freight estimates can be provided to customer’s specific location. ~ Customer’s choice of service ~ On customer’s account / not added to bill on Discovery invoices.